I started marketed the book pretty much right after I knew it was going to be published so around the Fall of 2009. It was released in March 2010. Most of my marketing has been online. I had already been blogging for two years before my book was accepted for publication and that became my base of operations. I revamped the site and registered my domain as jessiecarty.com instead of a generic wordpress address. I then made a blog site for the book to make it easier to list excepts etc. From there I continued to use Twitter and Facebook to promote readings etc. I’d also considered being published in online journals and being interviewed for magazines and via forums like BlogTalk Radio online marketing as well. I am also a fan of YouTube where I regularly make videos of poetry events as well as reading my own poems. I’ve also logged onto a few sites for forums and such but I don’t participate there as often. Each venue has its own advantages and drawbacks. I’d have to say that building a blogging community has been the most effective. And when I say blogging community, I mean COMMUNITY. Having a blog is one thing but finding readers is another. It takes time to find readers but the best way to start is that you should visit other blogs and leave comments. Finding readers is about being involved. Probably the least effective, for me, were the sites I joined that had a lot of the same features as say Facebook or a blog but were attempting to also have groups and forums. These were nice sites but I wasn’t able to really develop a community in those venues. Out IRL (in real life) I attend a few different open mic events in my local area. I’m also a member of several writing groups such as Charlotte Writer’s Club, NC Poetry Society, NC Writer’s Network and Poetry Council of NC. These groups have events and newsletters that are a pleasure to participate with. I am also scheduled to read at some libraries and bookstores. I’ve also spoken to creative writing groups, book clubs and I participated in an event where you read with other writers while telling stories about the process of writing. That was a lot of fun and was in front of a paying audience. I’m still early in my “book tour” though. Attending open mics has probably been the best thing for me. Not only do you develop a lot of friendships but you also get to practice interacting with an audience. You also, usually, don’t have to pay anyone else if you sell copies of your book (although tipping the venue is nice) whereas bookstores take a cut of sales. Reading in bookstores, however, does give you more access to advertising and to having your books stocked after just that event. Gallery crawls. Reading in an art gallery can be fun but if it is an event where people are coming in and out it is often difficult to even have an audience hear you. Before agreeing to one of these you should probably attend the event to get a feel for how it works. One of the things I am still working on for this book tour is to find more open mike locations to read at. I love open mikes that welcome a featured reader followed by other readers. Those are terrific venues and I hope with the next book (I am shopping around a 2nd poetry manuscript right now!) that i can participate in more events of that nature. I’d also like to find more book groups who’d like speakers. To order Paper House go to http://foldedword.bigcartel.com/product/paper-house-pre-order-signed. And you can also check out http://makingapaperhouse.wordpress.com which was a blog she made and lists all stores and online venues that have the book. 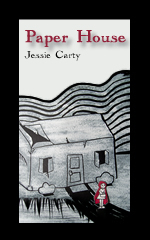 Jessie Carty’s writing has appeared in publications such as The Main Street Rag, Iodine Poetry Journal and The Houston Literary Review. She is the author of two poetry chapbooks At the A & P Meridiem (Pudding House 2009) and The Wait of Atom (Folded Word 2009) as well as a full length poetry collection, Paper House (Folded Word 2010). Jessie is a freelance writer and writing coach. She is also the photographer and editor for Referential Magazine. She can be found around the web, especially at http://jessiecarty.com where she blogs about everything from housework to the act of blogging itself. This entry was posted in Book Marketing Case Studies, Book Marketing Insider Secrets and tagged Book Marketing, Book Marketing Case Studies, insider secrets, Jessie Carty, paper house. Bookmark the permalink. thank you so much for the interview! Another I wanted to mention is how difficult it is to get into bookstores, especially with poetry and even more so when it is your first book! Jessie, you are such an inspiration!